Companies are susceptible to losing their customers as a result of disruptive technologies. 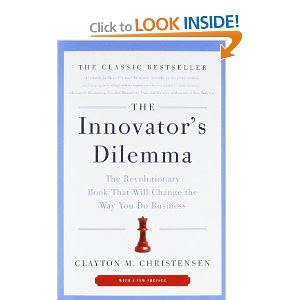 In The Innovator's Dilemma, Christensen demonstrates that companies are overtaken despite doing everything right - listening to customers and investing in the highest-return projects. By studying the disruptive process, Christensen shows how companies can defend themselves from disruptive technologies. Because organizations are likely to chase immediate returns and therefore constantly strive to move upmarket, they must give responsibility for disruptive technologies to organizations whose customers need them. This means separating out responsibility for disruptive technologies from the rest of the business. Since a sales/engineering/executive group will be unmotivated in pushing disruptive technologies that don't yet meet the needs of existing customers, a separate organization is needed if disruptive technologies are going to have a chance in an incumbent firm. The members of the separated segment can get excited about new customers with small orders - something the original firm could not do. Only then will enough resources be allocated to see to the success of the disruptive technology within the incumbent. Christensen demonstrated how well this strategy worked for various companies when disruption occurred in the PC, retail, and printing industries. I like this publication because it shows a different perspective.